Who's going to fall for this one? Saw this one near the office. Apparently this homeowner doesn't want to be bothered to hold a spot by putting an orange cone in the street; as many homeowners around the university do. A more pedestrian approach (by the student houses) is to put a chair or inverted trashcan in the street. 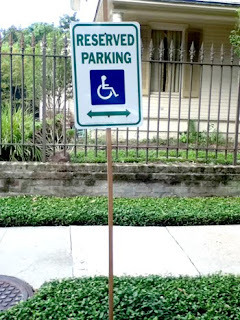 But a FAKE handicap sign on a SPINDLY STICK? This must have taken some thought. 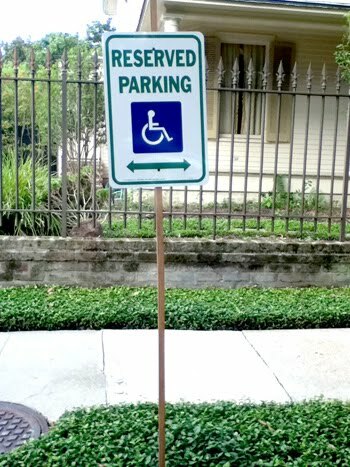 "I'll put up a sign to keep people from parking in front of my house. I'll purchase a sign. I'll put it on a FRIGGIN STICK and that'll convince people of its authenticity. I'm not put out by this sign. I don't park this far away from the university. But, as Jacob Marley said "Mankind was my business! Their common welfare was my business!" I should pull it up to keep the bully homeowners from staking out what is not rightfully theirs. Then again, its common to get your tires slashed by people as arrogant and ignorant as this one.